Disney resort hotels offer some world-class dining options. 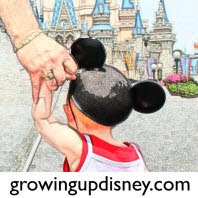 Here are a few favorites of the Growing Up Disney team. Ridge: When I think resort dining, I have to pick a time of day to suggest a favorite. For breakfast I can't think of much better than Tonga Toast at Kona Cafe. If you have never had such a ride on the sugar train as Tonga Toast will provide, you have not lived. Tonga Toast is banana stuffed sourdough French toast that is fried and then rolled in cinnamon sugar and served with a strawberry compote and your choice of ham, bacon or sausage. Pair this up with the 100% Kona coffee press pot, you have quite a breakfast to fuel you up for a park visit. Part of the gang at the "Testosterone Lunch"
If I am not in a park, a great place for lunch is the ESPN Club at the Boardwalk. This is a beer and burgers kind of joint. Nothing overly fancy and oddly enough I rarely get a burger here. They are really good and very large, but the Homerun Hotdog or the extreme Reuben Sandwich are two of my favorites. The hotdog is giant and can be topped with chili, cheese and onions. For the Reuben, when it says extreme they aren't kidding. The corned beef is piled high with sauerkraut and Swiss cheese and a thick rye bread. For dinner, go big and bold or go home. Boma is the way to go if you aren't looking for something intimate. Boma is at the Animal Kingdom Lodge downstairs from the lobby. The menu has items that could be found all over Africa offering a variety of breads, fruits and salads. Where Boma really brings the heat is with the meats, seafood and other African specialties. Bobotie: beef and lamb quiche, Durban spiced chicken and an awesome coconut curry seafood soup. Can't beat Boma for variety and quality. Everyone can find something to make them happy here. DisneyDad: When we go out to eat at home and my wife asks me where I'd like to go I usually give the same answer - Olivia's. Olivia's may not have the best food at WDW, but to me, it means I am "home." I try to eat there at least once on each trip. Over the years the menu and staff have changed (anyone remember the waitress from long ago called Wanda?) and the menu has been "updated." My favorite dessert at Olivia's is no longer on the menu, Key Lime White Chocolate Mousse. The absolute best meal I have ever eaten at WDW (possibly anywhere) was with my daughter two nights before she was married at The Wedding Pavilion. We had a special Father-Daughter meal together at the Chef's Table at Victoria and Albert's at Disney's Grand Floridian Resort. Our gastronomic adventure began with the Chef coming to talk to us about our likes, dislikes, and were we allergic to anything. There was no menu (we were presented with souvenir menus at the end of the meal.) We didn't choose what we were to eat. What followed was a ten course meal that was absolutely phenomenal. The chef explained what each dish was as it was served and each one was wonderful. Dinner was completed with a coffee service brewed in a unique vacuum coffee pot. While a once-in-a-lifetime experience, the Chef and staff made it an unforgettable event. Amy: Yes, I am a broken record. I love tea at the Grand Floridian. It's a fantastic way to spend the afternoon. It's very refined without being too fussy. Andy and I went to Jiko at Animal Kingdom Lodge on our last trip to celebrate our fifth wedding anniversary. It was fabulous with excellent food and service. We had great fun discussing the food. I know that sounds odd, but we don't get to go out much anymore! We had olive flatbread and ostrich for appetizers, filet mignon with mac & cheese and halibut for entrees and were given a pistachio creme brulee for dessert. Pics and full review coming soon. In early 2005, I crossed the top 3 items off my Disney bucket list. I received my Mickey medal for completing the Disney marathon, had a spectacular Disney Fairy Tale Wedding, and ate at the chef's table at Victoria and Albert's. Now that I've also watched my little girl toddle down Main Street USA with my dad, it's all downhill from here. Kidding! I agree with Dad, the meal at V&A was the best I will ever have and I am honored to have enjoyed it with him. I couldn't begin to tell you what all we ate but I'll scan the menus in soon. If you ever have a good reason for a huge splurge at WDW, don't pass up on Victoria and Albert's if for no other reason than there is a chocolate course! California Grill at the Contemporary is another remarkable Disney resort restaurant. We ate here for the rehearsal dinner. Our group was seated in the private dining room. The food was outstanding and the view of the fireworks over Magic Kingdom is unmatched. Boma is always delicious. It is an African inspired buffet at Animal Kingdom Lodge and never fails to please. Whispering Canyon at Wilderness Lodge offers a meal served family style and a heaping helping of hi-jinx. I love breakfast at Kona Cafe at the Polynesian Resort. Two words: Tonga toast. I know someone is screaming at their computer screen that they love Chef Mickey's. We went a billion years ago when it was at what was then the Disney Village. Our most recent visit was this past April for my daughter's first birthday. While we enjoyed the visit, it still has yet to earn its place in my favorites list. Here's my review of Chef Mickey's. What are your favorite places to dine at the WDW resorts? Did we include your favorite? Are we missing a place you love? Please comment below. For those foodies out there, I recommend The Wave. It's a little too out there for my husband but I've always enjoyed it. Corby, we are trying Kona for lunch this time. I'll have to check the menus and see if your favorites are available then because they sound great! We haven't checked out The Wave yet but it's on the to do list. My husband and I always loved California Grill. My parents would watch the kids so we could have one night out. But on one trip, we decided to change it up a little bit and try Artist Point at Wilderness Lodge. It was absolutely one of our most favorite meals on WDW property. The Smokey Portobello Soup is by far the best thing I have ever eaten anywhere. Now when we go to WDW, our big decision is: California Grill or Artist Point? California Grill obviously has the best view, but it is a nice boat ride over to Wilderness Lodge at night from the Magic Kingdom.